New Basic Law approved by a Knesset vote of 62-55 has distinct apartheid characteristics and requires racist acts as a constitutional value. 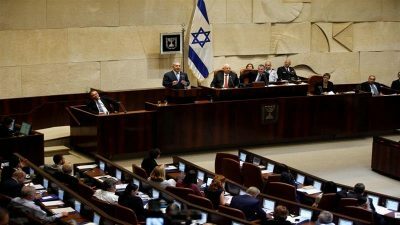 The Israeli Knesset voted 62 to 55 early today, Thursday, 19 July 2018, to approve the Jewish Nation-State Basic Law that constitutionally enshrines the identity of the State of Israel as the nation-state of the Jewish people. “The Land of Israel is the historical homeland of the Jewish people, in which the State of Israel was established” and that “the State of Israel is the nation-state of the Jewish people”. The “people” here are not limited to “Israeli Jews” nor is it defined in terms of the “state of all citizens”, but rather it includes the “Jewish people” wherever they are in the world. Palestinian citizens of Israel, who compromise 20% of the population, are totally excluded. Featured image is from silkroadgazette.com.